From 7 units to zero units of insulin. Read the case history of this young girl in her mother's own words. A simple change in diet started giving positive results. She has been advised to continue the medicines for little longer time so that the pancreas gets fully healed and the immune system doesn't get hyper again. He is dependent on Insulin for the last 6 years. He reported positive results in just 1 month time. This 28 years old lady from Hawai, USA was able to cut her insulin requirement by 1 units in just 1 and a half month time. 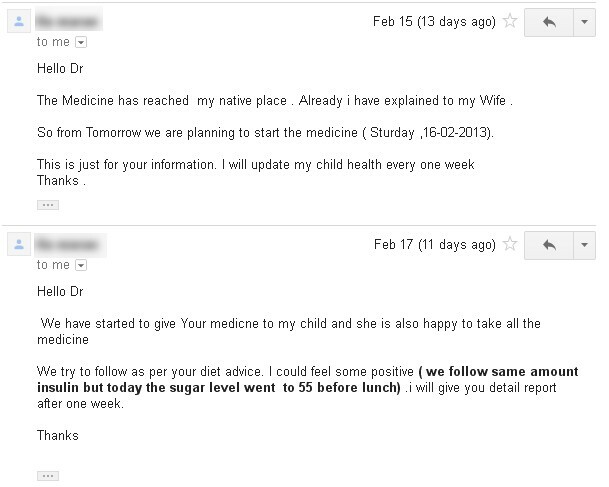 She started her journey of herbal medicines with Natural Care on 24th February, 2013. In 1 month time we are able to see the positive changes in her blood glucose readings. After one and a half month she was able to cut down her requirement of external insulin. This 69 years young dutch living in Taiwan was able to reduce his BP and blood glucose just with a change in diet and exercise. 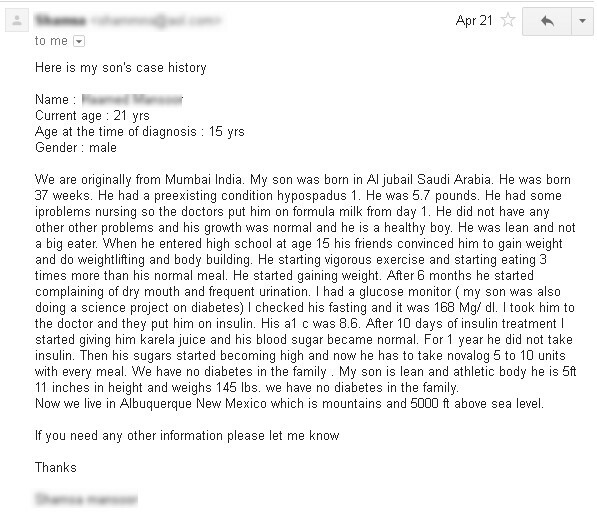 This 42 years old patient from Mexico who was residing some 16,000 kms away, contacted us for his RA and Type 1 Diabetes, with deep faith in herbal medicines. He was suffering with RA and Diabetes for the last 20 years. This 24 years old boy is able to bring his blood glucose from 337 to 138 in 7 months without insulin or other conventional medicines. 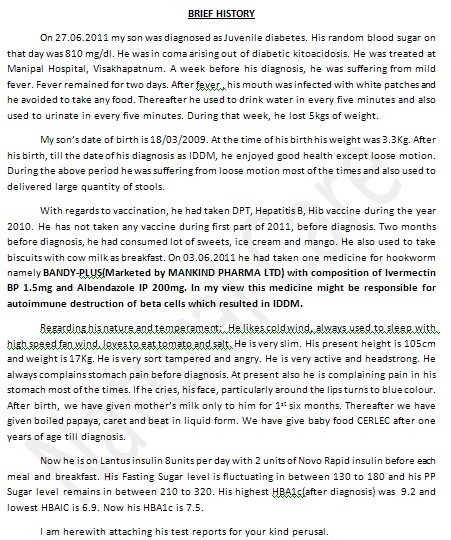 Read the case history of this young man who was advised to start Insulin by the conventional doctors. But he relied on herbal medicines only and just with the herbal medicines his fasting blood glucose reading came down from 337 to 138 in just 7 months time. Do remember, he is using only herbal medicines and many a times he is unable to take the medicines due to his work or travel. By end June, 2013, His fasting blood glucose reading has come down to 152. 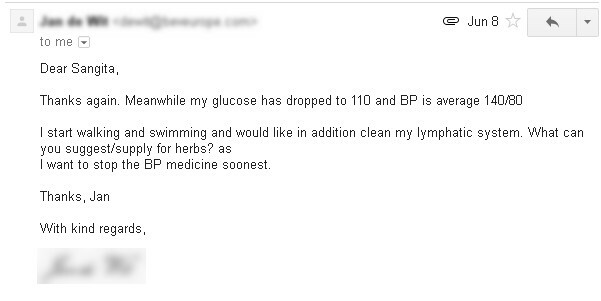 In July, 2013, His fasting Blood glucose reading has come down to 138. He has been advised to continue the medicines. Amazing journey from 337 to 138. And that too without the conventional medicines or external insulin. And many a times he misses his herbal medicines too due to his travel or work schedule. Her insulin requirement came down from 12 units to 9 units (25%) in just 2 days. the insulin requirement came down from 12 units per day to 9 units per day. a whooping 25% in just 2 days. Father of this 4 years old boy contacted us from Orissa, India with lots of hope. The child was being administered 16 units of insulin daily. After taking our herbal treatment for 2 months his insulin requirement has come down by 4 units. He has been advised to continue the treatment till his son is able to live insulin (external insulin) free life. This 28 years old girl is insulin dependent for the last 9 years. She was able to reduce her external insulin dependency by 25 unit in just 2 years. Read the case history in her own words. She has been advised to continue the medicines till she completely gets rid of external insulin. This 32 years old from Hyderabad, India came to me with the following problems - fatty liver, DM2, Hypertension, Obesity, fibroid, Numbness in hands, Vision problem, acidity, persistent headache, weakness and low energy. She always complained of vomiting tendency while traveling. In 10 days of treatment her headache went away, acidity gone, vomiting tendency gone, vision improved, numbness gone and significant improvement in the energy levels. In 3 months time her fasting blood glucose which always used to be above 170 came down to 130. She has been advised to continue the medicines for little longer duration to get rid of all her problems. This 62 years old female always had her fasting blood glucose reading in the range of 180 - 190 and PP always above 300 despite taking her conventional medicines. After using the herbal medicines and diet control and exercise for 3 months her fasting blood glucose reading came down to 125 and pp 180. She has been advised to continue with the diet control, exercise and meds regularly. This 44 years old lady traveled more then 800 kms to meet us and get her treatment. 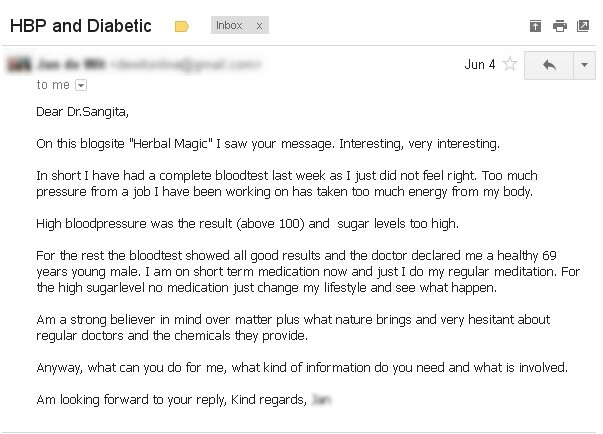 She was suffering from RA, Spondylitis, Migraine, Thyroid, Hyper tension, Type 2 Diabetes and Acidity. In just one month of she is free of her diabetes. 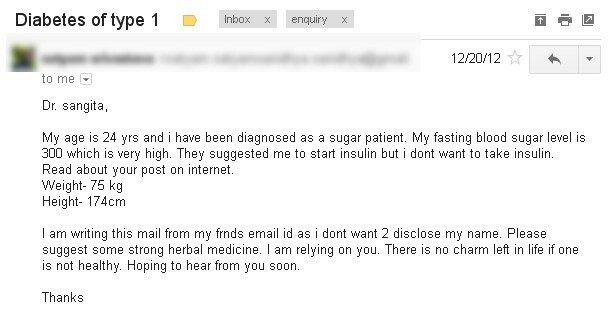 She is not using her allopathic medicines for diabetes and still her blood glucose readings are coming normal. She is living a pain free life.